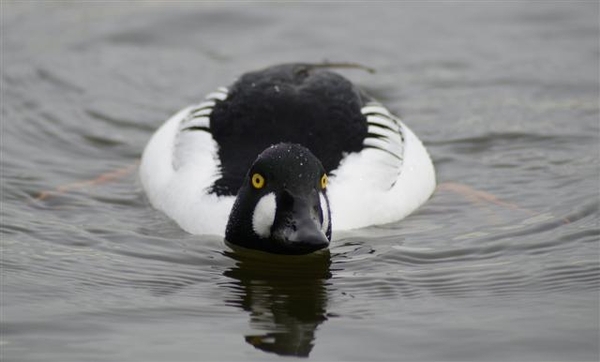 The Goldeneye is a diving duck which is equally at home on fresh or salt water. It is a regular winter visitor to our coast as well as fresh water ponds and lochs. 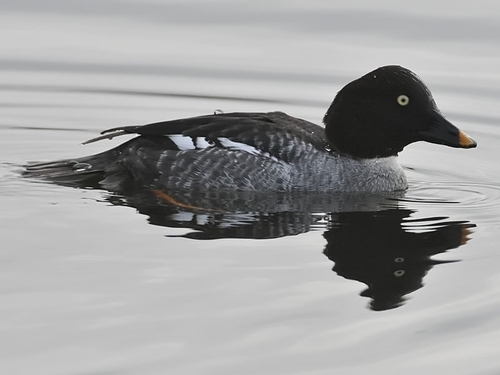 Last winter there were twenty-six records from fifteen locations including four Goldeneye at Port na Lochan on the west and three at Clauchlands in the east. The male Goldeneye adds a bright note to winter days with its radiant golden eye, glistening green-black head, and crisp black-and-white body and wings. The female has a chocolate brown head with the same bright eye that gives this species its name. These distinctively shaped, large-headed ducks dive for their food, eating mostly aquatic invertebrates and small fish. Most Goldeneye which winter here come from north or north-eastern Europe, arriving in October or November. They breed by the lakes and rivers of boreal forests across Canada and the northern United States, Scandinavia and northern Russia. They are migratory and most winter in protected coastal waters or open inland waters at more temperate latitudes including Arran. Goldeneye return to their breeding grounds in April, where they breed in tree holes in woodland beside lakes and large rivers. They first nested in Scotland in the Grampians in 1970, and since then birds have been attracted to nest in specially designed boxes put up on trees close to their favoured lakes and rivers. Courtship displays begin during the winter and it is common to see groups of male Goldeneye throwing their heads back and forward for the watching females. Look out for these charming ducks this winter.